After lots of requests from you all for more fashion posts - and lots of you asking for recommendations on shoes, I decided #shoeggestions was the perfect partner to our Southern In-Law style series! I've had trouble finding boots that fit me for what seems like forever. My small legs mean that boots have always looked like galloshes or gumboots - or I've struggled to walk in them because they were so gapey. But that's when DUO Boots came to the rescue! You see, DUO Boots (and shoes!) are made to fit you - and with 21 calf sizes and 3 foot widths, you'll be able to find a boot that fits you perfectly. Just take a look at my boots! I think a good pair of boots are something every woman should invest in. 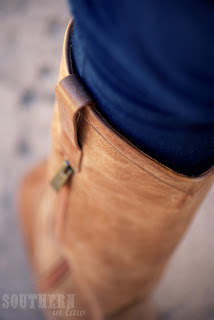 They're perfect for winter and can be dressed up or down - and they can really make an outfit! 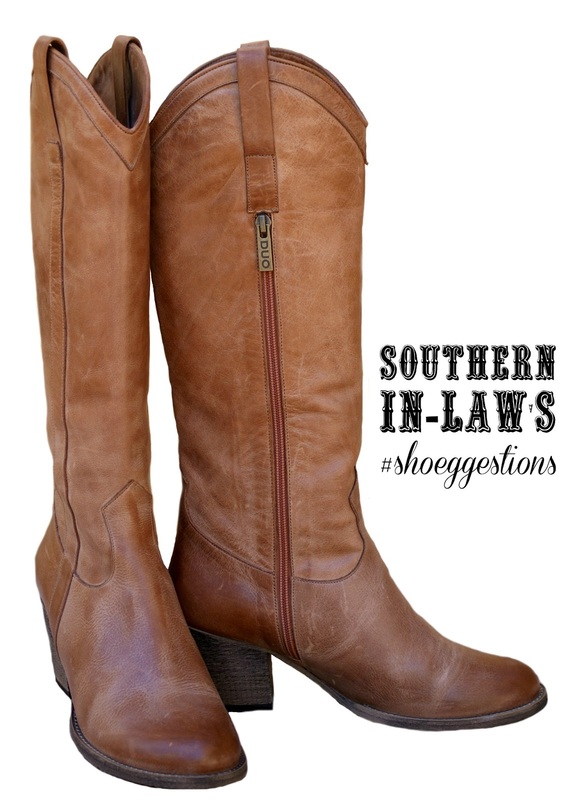 This is Southern In-Law, so naturally, the Nevada boots grabbed my attention right away. I sent off a picture of the boots to Jesse, asking if he thought these ones would be good - and I immediately got an answer - "YES!" 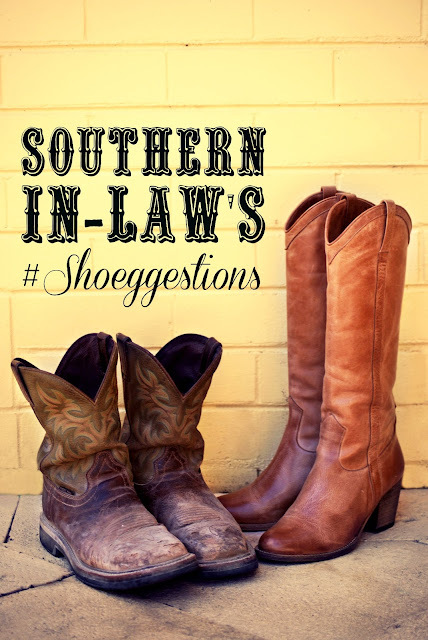 There was only one problem, according to Jesse, they didn't have those "Southern style decoration" - but I told him that this was a Southern In-Law boot - so it had to be a little different. When going to order the boots, I was a little worried as my calves were slightly over the centimetre mark - so I wasn't sure to go up a size or the size below in the calf measurements. 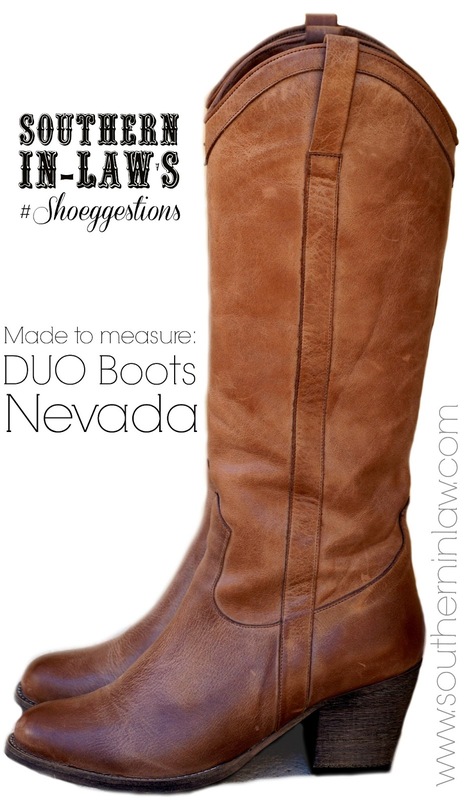 The DUO Boots team recommend going down a size for a snug fit - and I'm so glad I did as these fit perfectly! They're not tight whatsoever and make my legs look really good. I'm a little bit taller than Jesse in them, thanks to the heel - but luckily he doesn't mind that as they're so cute. Here you can see just how well they fit - and oh am I in love with them. They're so comfy and brilliantly made - and definitely something I would suggest every woman invest in. These boots are going to last a long time and get you tonnes of wear out of them - and you'll feel great and look fabulous. They have so many great pairs of boots in so many different colours, lengths and heel sizes - it's like boot heaven! What styles are available? Every style you could think of! They have boots, ankle boots, shoes including espadrilles, loafers, peep toes and wedges - and they also have handbags! Where do they ship to? Anywhere in the world, free! But tell me, do you have a favourite pair of boots in your wardrobe - or are you more of a flats/heels kinda girl? I've been a ballet flat lover for years but now I'm obsessed with these boots! Kristy received these boots courtesy of DUO Boots. No compensation was received for this review and, as always, all opinions are entirely her own and have not been influenced by the company in any way. Cute, Kristy! I like the western inspiration. I'm usually at the Calgary Stampede this time of year sporting some cowboy boots. Cool idea to style your own dimensions as well. I have really muscular calves, so have the opposite problem! I'm obsessed with my Frye Melissa Button riding boots. They seriously go with everything. I questioned bringing them with me to Australia (Canadian thinking it would be hot all year), but I've been wearing them all the time! Definitely have a look at DUO Boots - they will fit anyone! Ooh i'll have to give these a try!! I'm here to talk about today - I'm here womens brown boots to introduce you to a new series here in Southern In-Law. It's one I'm calling..